Executive suites now offered close to the I-183 offering easy access to Hunt Valley and to Shawan Road. The facility well appointed and furnished offices suites with ergonomic designs for its furniture including desks, chairs, and bookcases. 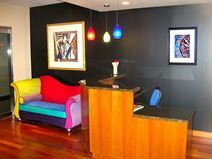 High speed internet service is offered and a large TV monitor can be used for conferencing and presentation purposes. This brand New Class "A" Executive Suites located just north of Baltimore. There is convenient access via I 83 makes for an ideal commute to Sparks. It is just two miles north of Hunt Valley and Shawan Road. This secured office space has main keypad code access for 24/7 unrestricted building access. There are mailboxes in building common area also has outgoing USPS and Federal Express boxes. It is conveniently located on the second floor with free and unreserved parking directly in front/rear/side of the building provides easy client access.